Egg #3 for Beauty, and a Mate for Quest? Beauty laid her third egg today. We’re not exactly sure when, because she spent a lot of time in the nest box and she didn’t let us see what was going on. Both Beauty and Archer have been on the eggs most of the day. That might be due to the cooler weather, or it could signal the start of “hard” incubation. If that’s the case, then we should be able to expect one more egg, for a total of four. 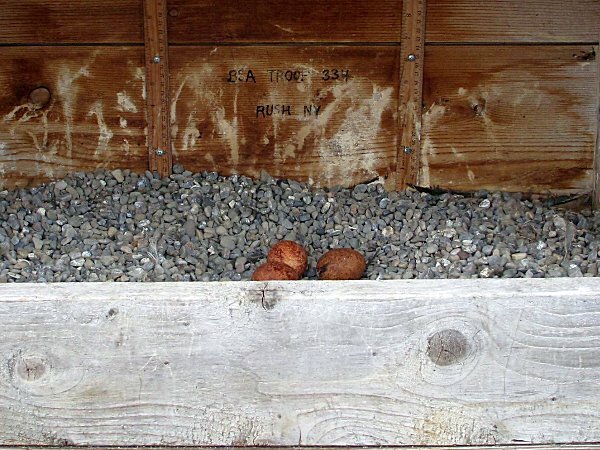 Since the most recent pair of eggs have come at a more-or-less typical peregrine pace, if Beauty does lay another egg we should see it in the next 2 to 3 days. In other news, the recent location data from Quest’s satellite transmitter has been nearly stationary for the past several days. Some observers began to speculate that perhaps her transmitter had finally fallen off. 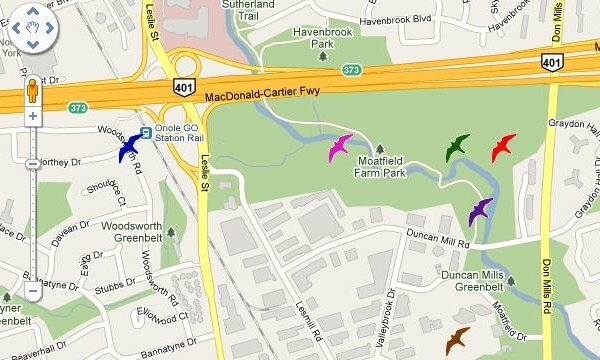 But earlier today our friends at the Canadian Peregrine Foundation posted that two falcons, one outfitted with a transmitter, had been spotted on a commercial building in the city of York, Ontario Canada, just east of Toronto. The address for the sighting matched exactly to the location data we’ve been getting from Quest, and Bruce Massey, one of the CPF volunteers, was able to confirm her ID band numbers! It turns out that Quest has been hanging out with a handsome tiercel. Read the full account from CPF watcher Tracy Simpson HERE. Needless to say we’re thrilled to learn that Quest may finally have found a place to settle down, and that she could be starting a family of her own. We’ll keep a close watch on this story, and bring all of the details to you as we learn more! We were starting to think that there might be a problem with Beauty’s egg-laying this year, but she delivered, depositing egg #2 in the wee hours of the morning. 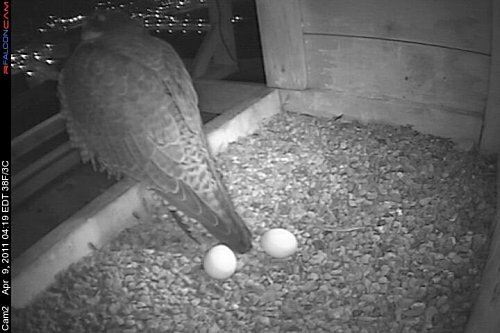 Our best guess at a time, based on images from our cameras is that she laid the egg around 1:14 AM. We didn’t get a look at it until three hours later. After some well deserved rest in the nest box, Beauty left the eggs, but she was back earlier this morning. So, when can we expect the next egg from Beauty? With our unofficial motto specto subitus firmly in mind the answer is… well, we don’t really know. Beauty’s keeping her own schedule and she’s not letting us in on it. The next egg could be a couple of days away, or another week, so keep watching! Yep, you heard us right! Some time around 7:30 this evening Beauty laid her first egg of the season. Peregrines usually lay their eggs 48 to 72 hours apart, so sometime on Sunday we should see egg #2. Last year Beauty laid a total of four eggs, but only two hatched. That’s not unusual for first time peregrine parents. This time around we’re hoping that all of her eggs will make it to hatching. Archer has proven himself to be an apt provider for his family so we have no doubt that if we get the usual clutch of 3-4 eyases, (falcon hatchlings), they’ll be well fed and taken care of. So, if you want to keep an eye out for the next egg, here are some signs that Beauty may be getting ready to lay the next one. 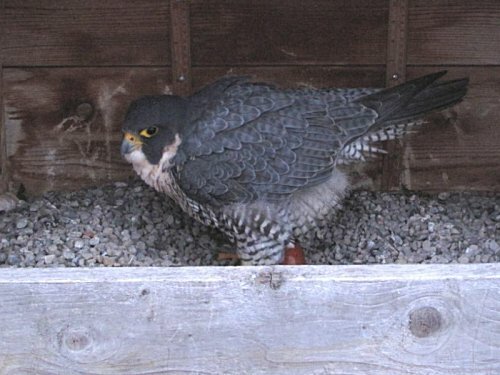 She’ll spend a lot of time in the nest box, sitting over the bowl-like scrape that she and Archer have dug into the gravel. She may look tired and disheveled, and have a heavy, gravid appearance. She can be in that condition for as little as a couple of hours before laying, to as much as a day. Then, when she’s actually delivering the egg, she’ll be restless, changing her position frequently. The actual moment at which the egg is deposited can be hard to spot, but thanks to our live video streams you should have an unparalleled opportunity to share in the excitement. And of course, we’ll keep our eyes open too, and announce the happy news as soon as it happens! You are currently browsing the Imprints blog archives for April, 2011.